At work? On vacation? No matter where you are, the Mini Plus keeps you up-to-date on what's happening at home with motion detection alerts. (Need to activate manually). Mini Plus is rated 4.5 out of 5 by 182. Rated 4 out of 5 by Rutabaga from Great inexpensive webcam. App quite unstable Webcam is packed with features and improves on the original Mini Camera. Motion detection with sensitivity adjustment, great night vision, solid overall picture quality. 2 way sound is improved with latest software update but still not great. The app is really the weak part. When starting, I usually get a crash "software exception" about 50% of the time. I need to close all programs on my cell phone and open the app again. Also sometimes the loading of a cameras view is slow or will crash (% loading climbs to 70-90% then reloads over and over). This is my main complaint about the unit and I wish Ezviz fixes this annoying issue about the app. Rated 5 out of 5 by Nikki91 from Great Cameras! I tried other cameras prior to EZVIZ and was greatly disappointed. I didn't want to spend $200 a piece for my cameras (nest, etc.). I found my 1080p HD cameras with EZVIZ and bought two for half the cost of one of the more expensive brands. The cameras were easy to set-up and only took a few minutes. The video quality is great! The app was easy to set-up and add both of my cameras to. If there is internet in the house, and I have wifi or network service, I can log into my cameras at any time! Rated 5 out of 5 by orrink from Amazing Little Camera I have two houses with one in Hawaii. I employed two Alarm Companies. Recently, I flew to Hawaii based on a false alarm. I have installed EZVIZ cameras in both properties and fired the alarm company in Hawaii. I can see what is going on in my house as notify the police faster than the alarm company can and did. The cameras are very high quality and I love getting notifications daily. The cameras plug into household current and would be useless if there is a power failure however. They are very sensitive and even react to auto lights coming on each day. I am very happy with this product and highly recommend them. Rated 3 out of 5 by Redcrawl from Sound issues spoil a good product Great except the audio has a constant popping hiss sound when turned on. It masks all other sounds, making the audio function unusable. I tried moving it away from any interference and it didn’t help. Also, EZVIZ is yet to develop a TRUE iPad app. The current app works on the iPad, but you can tell it’s only really for the iPhone. One more sticking point is the cable cord and it’s AC adapter. The usb cord plugs in to the adapter in such a way that the entire thing sticks out from the wall several inches. If they redesigned it so that the cord plugged in to the side or bottom of the adapter, it would make it easier to put furniture etc. up against the cord. Rated 5 out of 5 by Jason34 from Amazing Camera for the money! 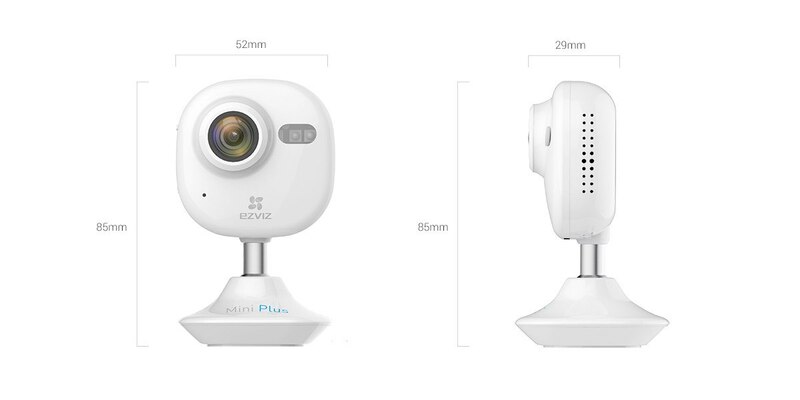 The Ezviz Mini Plus 1080p Wi-Fi camera is a great addition to your home or business. Whether you are using this for security, a baby monitor, or just to check in on your family while out of town on business. This camera has many great features that are listed below. 1. Items included. After receiving the mini HD camera, I noted the camera contains the following items: camera USB connector, separate power plug, instruction manual, quick start guide, and mounting hardware. 2. Setup and install. The setup and install was quite simple. Connect the USB connector to the camera, and download the the Ezviz camera app. Once the app is downloaded, it will ask you to create an account. The process was fast, and I then scanned the QR code on the back of the camera. Once the app has connected to the camera it will ask for you to connect to your wifi network. The entire connection process took about 5 minutes. You can also move the camera head up and down and it swivels on its base. Another nice feature is that the camera includes mounting hardware, and the base of the camera has a strong magnet. You can just set it on any metallic object and you are ready to go, with no assembly or mounting required. This is very useful if you are not handy with a drill or screw driver. 3. App and user interface. Overall the app interface is fairly simple. The menus are easy to understand and very straightforward. Once you launch the app the main camera screen appears. If you turn your phone horizontal, it will automatically change the camera to landscape view and you will see the camera full screen. The next menu at the bottom of the app is the messages menu. This is where all the message alerts and warnings are stored when the camera detected motion. The last menu button is the settings menu. Here you can change your account settings, the function settings, cloud play, and IFTTT settings. 4. Camera functionality. I have tried many security and WI-FI cameras around my home, but this one has amazing clarity in the day and night time. The motion tracking is exceptional, and can be set for different sensitivity levels. The two way voice communication is a great feature. I used it as a baby monitor in my girls room and the cameras pink color matched well with the room decor. This cameras wide angle lens is amazing. I set it on our fireplace mantle and its lens covered our entire downstairs with one camera! The camera also features cloud play functionality, which enables automatic recording and accessibility to those stored videos through the app anytime. Ezviz charges a small fee for for this feature, but this is a great option to have with the camera. Also another great feature, if you don't want to pay the subscription fee, the camera also accepts up to a 128GB micro SD memory card that records video directly to the card to be accessed later. This is a great feature if you just have over camera and don't want to pay the fee for the cloud play service. I really love that Ezviz gives you that option. I looked into getting other Wi-Fi cameras, but most of them require you to pay a monthly fee. 5. Smart integration. The camera also integrated with smart devices like Google Home and Amazon Echo. I am able to say"Alexa, turn off the camera," and it will put the camera in sleep mode. I can use the smart integration to make the camera sleep and wake up, which is nice, but it's very limited in that functionality. I wish there was a skill directly for the camera that enables additional functionality. Overall the Ezviz Mini Plus 1080p Wi-Fi Indoor Cloud Camera- Pink is an exceptional camera with great clarity, easy to use features, cloud accessibility, and smart home integration. It allows you to keep an eye on your home, or office connected to your Wi-Fi, or halfway around the world with just an internet connection. It offers two way communication that works great whether you want to use it as a baby monitor or just check in on your kids while your away on business. It is definitely the best camera I have used! Rated 5 out of 5 by whoharris from Spectacular Picture I really like this little cam. I have an old Mini, which I really like, but the picture quality is night and day. When you zoom, you can actually make out details, which was tough with the old Mini. I have only had it hooked up for about a week and a half and time will tell. I have no issues with my Mini which I've had for over a year with no issues. The UI could make me happier with more options in settings. It's a bit of a hassle to find how to set sleep times, but since it's compatible with IFTTT, that can be taken care of. 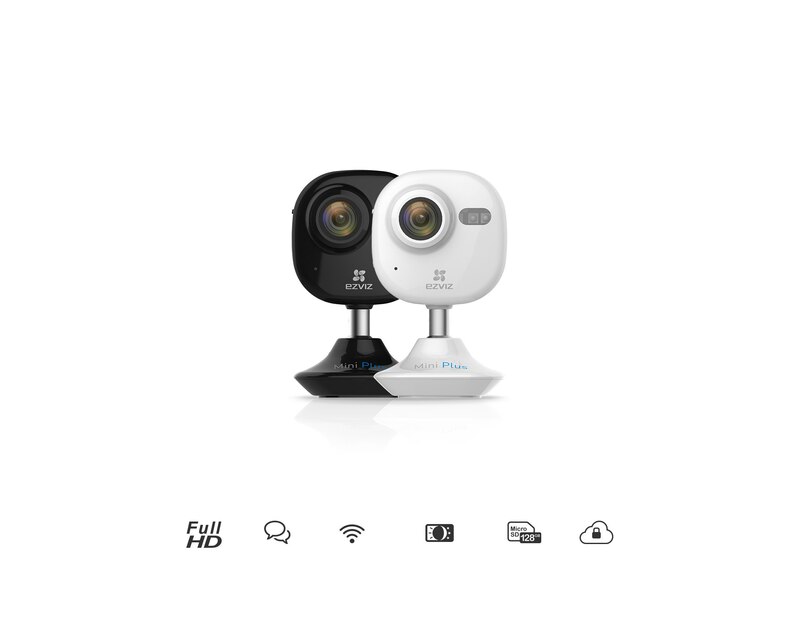 All in all, it's a great little cam and I would recommend it to anyone wanting a good indoor surveillance camera at a cost-conscious price. Rated 5 out of 5 by Stormydae from Awesome Camera You can be with your friends or family from anywhere in the world with this camera. Setup and use was very easy as it is compact and can be placed about anywhere. It has 1080p resolution motion sensor and two way audio which is clear. You have to download the app to your phone and it is user friendly. It needs to be within a few feet of an outlet as it needs to be plugged in. Picture quality is good and as mentioned earlier the two way audio makes it easy to talk to the dog and keep him off of the sofa. It comes with a metal mounting plate that can be placed on a wall as the base of the camera is magnetic. Overall this camera is great and I am very pleased with it. Hi, How to manage 1080p from this camera? All videos even when switched to HI-DEF are 720p... Video is not so clear like on my xiaomi YI 1080p camera. What i do wrong? I definitely buy Mini Plus and it from authorized resseler. Please Help. My device keeps telling me &quot;you have reached the maximum connections to the device&quot; whenever i try to view it. My regular mini still works fine, but the plus keeps failing. Support said remove device &amp; re-add, which didn't work. I have been having the same issue for about 6 months now. When I try to view the video from an alert is when it happens to me. Viewing live video works fine. It used to work great. Not sure what changed. Support said it was my internet speed but it is NOT my internet speed. If it was, I wouldn't be able to view live video I don't think. Wish I knew how to resolve this. I've been considering other solutions. I'd like to purchase a small security camera that DOES NOT require being set up with a mobile phone or app. I'd like to ONLY utilize an SD card to store the footage. Is this possible with this camera? I do NOT want to have to connect it to a phone. Am I able to hear audio without turning on the 2way audio? I cant figure that out. 1) Unfortunately, I was expecting it to RECORD 24/7... Is it possible ? 2) Under Storage Option- I am getting only Memory Card option, I cant see Cloud option. I just bought the mini plus for indoors. How do I save a live or saved motion detected video that I view, to my phone's storage, like I can with my Skybell security camera...even if I am out of the house? Hi, I am in the UK and I like your product range. I am interested in, amongst other things, cameras that run on batteries and I note that the Mini Trooper is not available in the UK. Mini+ is shown without wires (on a fridge). Is that battery powered? Camera not recording to SD card even though it's enabled. The SD card came with the camera. It worked before, I upgraded my internet so I had to reconnect my camera and now its not working. It doesn't beep when there's activity nor is it recording. We&rsquo;re sorry things aren&rsquo;t going smoothly. Please ensure that you have initialized the SD card from the storage status menu. Once the SD card has been initialized, the device will start recording videos to the SD card. Notification sound mode can be enabled from within the alarm notification settings page of the camera, please ensure that you have that settings set to soft or intense to receive a beep notification from the camera when motion is detected. We have a team of experts ready to help get everything back on track. Give the EZVIZ Tech Team a call at 1.855.MYEZVIZ (693.9849) Mondays &ndash; Fridays 7am &ndash; 6pm Pacific Time or email us at service@ezvizlife.com. We love to help!